Introduced in 1945, the Rolex Air King is one of four "Air" models designed to honor the British Royal Air Force for their efforts in World War II, and the only one of those collections that remains in production. 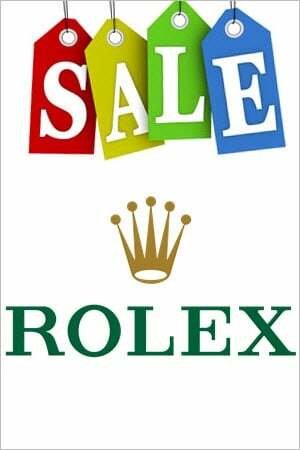 In many ways, it is the most simple of all the Rolex timepieces and has helped to make it a firm favorite with serious collectors and more casual watch buyers alike. It is also considered to be an entry-level model in terms of its pricing, making it a great option for first-time luxury watch buyers. The Air King's clean dial face offers excellent legibility with durability from the 904L stainless steel Oyster case, offering resistance to corrosion, as well as water resistance for up to 100 meters. Originally released in 1945, the Rolex Air-King is the last-remaining model from the manufacturer's 'Air Series', which also included the Air-Tiger, Air-Giant and Air-Lion. Like those other models, it was intended to honour the pilots of the British Royal Air Force, who fought in the Battle of Britain during World War II. The watch itself is classed as a pilot's watch, although is loved by a wide range of different people, due to its simplicity, history and affordability. Although the collection was briefly discontinued in 2014, it was reintroduced in 2016 as a single model. Here, we take a more detailed look at the evolution of one of the oldest Rolex timepieces. Following the end of the Second World War, Rolex introduced the first Air-King model, known as the Reference 4925. It featured a 34mm case diameter, which would be considered small today, but which was considered large in comparison to similar models at the time. Indeed, the Air-King quickly became known as the "Warrior Watch". 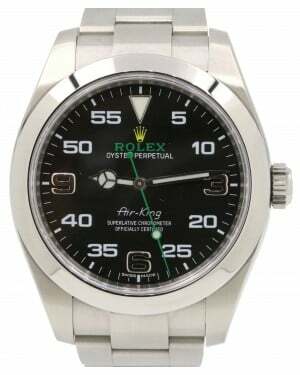 This early model established the basic Air-King aesthetic, with defining features including its case size, stainless steel material and clean appearance, with no major complications. As a result, it was able to be worn by men and women alike and was considered a solid entry-level model for new Rolex buyers. A few subtle changes were made with the release of the Reference 4499, which still utilised the same Hunter movement used in the Reference 4925. Then, in 1953, the transitional Reference 6552 was released. For this model, Rolex switched to an in-house calibre 1030 movement, which set the stage for future releases. Four years later, in 1957, Rolex released the Air-King Reference 5500, which made use of either a calibre 1520 or 1530 movement, depending on the market it was sold in. Models with the 1520 movement had 'Precision' written on the dial, while those with the 1530 had 'Super Precision' written instead. In total, the Reference 5500 remained in production for 37 years and its production run included a large number of different dials. One dial, which featured both 'Air-King' and 'Super Precision' in red writing, is known as the 'Double Red Dial' and is extremely rare, making it highly sought-after by collectors. 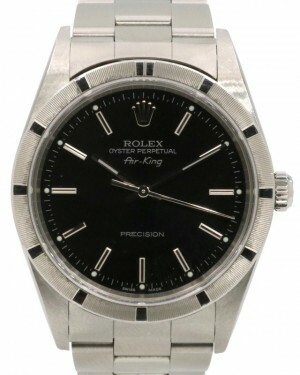 While Reference 5500 was in production, Rolex also released a number of additional Air-King models in certain markets, with examples including the Air-King Date and the Air-King 550X, which were both released in several Commonwealth countries. These models utilised a 35mm case more commonly associated with the 5504 Explorer. After several decades of consistency, the Air-King was given an update with the release of the Reference 14000, which included an updated calibre 3000 movement. This was followed by the release of the Reference 14010, which saw the introduction of the engine turned bezel. In 2000, both 14000 series models were given the calibre 3130. Several years later, in 2007, the Air-King collection was given a complete facelift with the release of the Reference 1142XX. This series was the first Air-King generation to receive COSC certification, and it also featured the introduction of a thicker case and new bracelet. 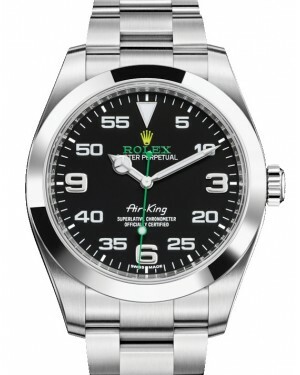 Nevertheless, in 2014, the Air-King was discontinued. Following a two-year hiatus, Rolex re-introduced the Air-King in 2016. The newest Air-King, Reference 116900, is aesthetically similar to predecessors, but features a larger 40mm case and has additional anti-magnetic qualities. With a cheaper price point than models like the Explorer, it is once again established as a great entry-level option. Celebrities and other famous faces known to have worn Rolex Air-King watches over the years have included the actress Jennifer Aniston, the US Senator John McCain and the tennis star Jim Courier.